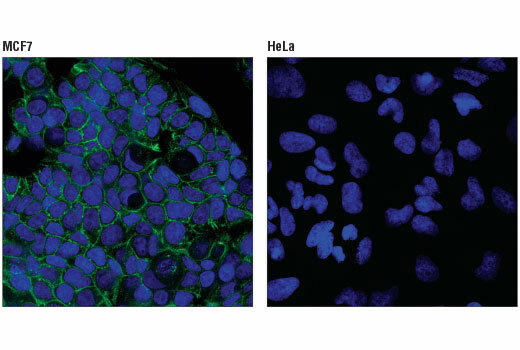 Confocal immunofluorescent analysis of MCF7 (left) and HeLa (right) cells using E-Cadherin (4A2) Mouse mAb (Alexa Fluor® 488 Conjugate) (green). Blue pseudocolor= DRAQ5® #4084 (fluorescent DNA dye). Flow cytometric analysis of HeLa (blue) and MCF7 (green) cells using E-Cadherin (4A2) Mouse mAb (Alexa Fluor® 488 Conjugate). 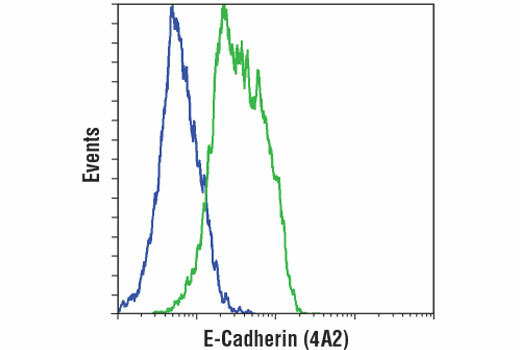 E-Cadherin (4A2) Mouse mAb (Alexa Fluor® 488 Conjugate) recognizes endogenous levels of total E-cadherin protein. This antibody does not cross-react with other cadherin proteins. Monoclonal antibody is produced by immunizing animals with recombinant protein specific to human E-cadherin protein. This Cell Signaling Technology antibody is conjugated to Alexa Fluor® 488 fluorescent dye and tested in-house for direct flow cytometric analysis in human cells. This antibody is expected to exhibit the same species cross-reactivity as the unconjugated E-Cadherin (4A2) Mouse mAb #14472. Cadherins are a superfamily of transmembrane glycoproteins that contain cadherin repeats of approximately 100 residues in their extracellular domain. Cadherins mediate calcium-dependent cell-cell adhesion and play critical roles in normal tissue development (1). The classic cadherin subfamily includes N-, P-, R-, B-, and E-cadherins, as well as about ten other members that are found in adherens junctions, a cellular structure near the apical surface of polarized epithelial cells. The cytoplasmic domain of classical cadherins interacts with β-catenin, γ-catenin (also called plakoglobin), and p120 catenin. β-catenin and γ-catenin associate with α-catenin, which links the cadherin-catenin complex to the actin cytoskeleton (1,2). While β- and γ-catenin play structural roles in the junctional complex, p120 regulates cadherin adhesive activity and trafficking (1-4). Investigators consider E-cadherin an active suppressor of invasion and growth of many epithelial cancers (1-3). Research studies indicate that cancer cells have upregulated N-cadherin in addition to loss of E-cadherin. This change in cadherin expression is called the "cadherin switch." N-cadherin cooperates with the FGF receptor, leading to overexpression of MMP-9 and cellular invasion (3). Research studies have shown that in endothelial cells, VE-cadherin signaling, expression, and localization correlate with vascular permeability and tumor angiogenesis (5,6). Investigators have also demonstrated that expression of P-cadherin, which is normally present in epithelial cells, is also altered in ovarian and other human cancers (7,8). Wheelock, M.J. and Johnson, K.R. (2003) Annu Rev Cell Dev Biol 19, 207-35. Christofori, G. (2003) EMBO J 22, 2318-23. Hazan, R.B. et al. (2004) Ann N Y Acad Sci 1014, 155-63. Bryant, D.M. and Stow, J.L. (2004) Trends Cell Biol 14, 427-34. Rabascio, C. et al. (2004) Cancer Res 64, 4373-7. Yamaoka-Tojo, M. et al. (2006) Arterioscler Thromb Vasc Biol 26, 1991-7. Patel, I.S. et al. (2003) Int J Cancer 106, 172-7. Sanders, D.S. et al. (2000) J Pathol 190, 526-30.